Here at Deancent Garage, we stand behind our Products. If we wouldn’t put it on our own vehicles, we wouldn’t sell it to you to put on yours. This is why we offer a full 30-day 100% money back guarantee from the date of delivery if you are not completely satisfied with your purchase. 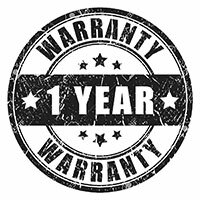 On top of that all of our products come with a full 1-year warranty. We also include free, fully track-able shipping on all orders from our warehouse to your selected destination so you have peace of mind knowing your package is safely on it’s way. If your looking for more information please use the buttons below. An issue with your product, or maybe it’s not exactly what you expected. Regardless of the reason, we offer a full 30-day guarantee from the date of delivery on all orders. We know the internet can be a crazy place at the best of times so here at Deancent Garage, we try our best to make things as easy as possible for you. We’ll cover the return shipping for any defective products and anything you feel wasn’t as described. You can choose to either receive a full refund of the product price, or exchange for another product. Please contact us for the return process before you return any items. Every product we sell comes with a full one-year warranty and if that wasn’t enough, we’ll pay the return shipping for any orders placed within North America if you experience any issues with the item you purchase. If you experience any issues during the warranty period, contact us with the contact form at the bottom of this page and we’ll take care of it. For International orders, please contact us for the warranty procedure. We offer FREE worldwide shipping on all orders. All orders are fully track-able from our warehouse to your selected destination. Most orders in North America will arrive in 2-3 weeks. Some International orders can take up to 4 weeks, see shipping chart below. Your order will be dispatched within 1 to 2 working days of receiving payment (Monday-Friday). We can only ship to the address you have on file when you purchase an item, please make sure your address is updated before placing an order. Below times are for reference ONLY. Shipping might be delayed by holidays, events and other uncertainties such as customs. Please see shipping schedule below for detailed shipping times. In the very unlikely event that your item is lost or damaged during shipping, we will work with you and the postal company to come to a resolution. If you have any requests for payment methods please do not hesitate to ask. Import duties, taxes and charges are not included in the item price or shipping charges. Please check with your country customs office for these additional charges. These are not charges we have any control of. If you have any further questions about the return policy, shipping policy or warranty please do not hesitate to contact us below. We usually respond within 24 hours. During busy times such as holidays, our response could be delayed but we will get back to you as son as possible.